The future of global fisheries will not be determined by the United States or Europe alone. East Asia, in particular, looms as the arbiter of many ocean fisheries. As part of our efforts to improve and support the sustainability of wild fisheries in Japan, the Russian Far East, and East Asia as a whole, we organized a panel at this year’s Seafood Summit in New Orleans. Panelists included representatives from the Hokkaido gyoren, the largest commercial fishery cooperative in Japan, and leading scientists from both Russia and Japan. Our panel looked at how countries in the Far East catch and manage their domestic fisheries and explored how they are addressing sustainability challenges such as over harvest, habitat impacts, and illegal fishing. Most importantly, the Japanese panelists released publicly, for the first time in the below presentations, information about their extensive sustainability efforts to date. While our Hokkaido colleagues have yet to announce a public fishery improvement project (FIP), you can see that much progress has been made (along with some setbacks too) to improve their fishery. Fukuda-san is the Deputy Director of Sales Department, Hokkaido Federation of Fishermen’s Cooperatives (Dogyoren). 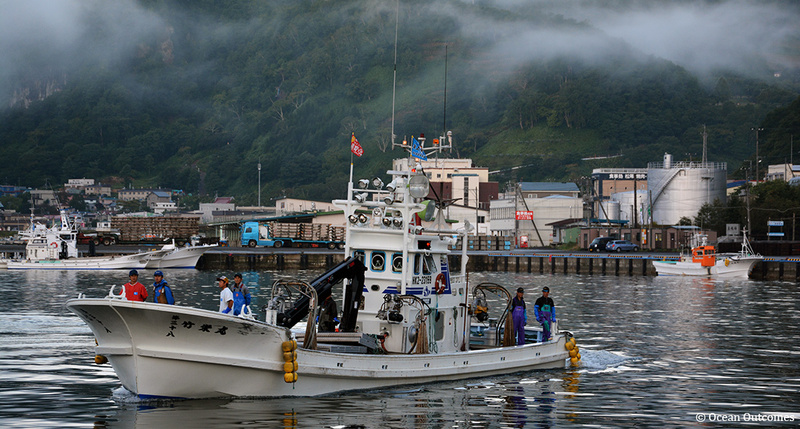 Dogyoren is the largest regional fishery cooperative by catch volume in Japan. Fukuda-san has been managing Dogyoren’s sustainability efforts including its project to achieve MSC certification. Dr. Nagata is a Director of Salmon and Freshwater Research Institute containing two divisions and two research branches. His research includes forecast and management of Hokkaido salmon (chum, pink and masu); monitoring activity for wild and hatchery salmon; conservation activity for wild salmon and their habitats, and scientific advices for assessment of MSC and FIP in the Hokkaido chum salmon fishery. Dr. Dmitry Lajus, Associate Professor in the Department of Ichthyology and Hydrobiology of St Petersburg State University. Dmitry holds a BS and MS from St. Petersburg University, and a PhD from the Zoological Institute of the Russian Academy of Sciences. He also was a Fulbright Fellow in university of New Hampshire. Dmitry has been instrumental in leading both MSC assessments and improvement projects for wild fisheries across Russia.